Kigo (season word(s), from the Japanese 季語, kigo) are words or phrases that are generally associated with a particular season. Kigo were originally used in the longer linked-verse form known as renga, and especially in the opening verse of a renga, the hokku, to indicate the season when the stanza is set. They are valuable in providing an economy of expression for the very short Japanese poetry known as haiku to indicate the season in which the poem is set. Representation of and reference to the seasons has always been important in Japanese culture and poetry. The first anthology of Japanese poetry, the mid 8th century Man'yōshū, had several sections devoted to the seasons. By the time of the first imperial Japanese anthology, the Kokinshū, a century and a half later (AD 905 ) the season sections had become a much larger part of that anthology. Both of these anthologies also had sections for other categories, such as love poems and miscellaneous (zō) poems. The writing of the linked verses of renga started in the middle of Heian period (roughly 1000) and developed through the medieval era. By the 13th century there were very set rules for the writing of renga, and the formal structure of renga specified that about half of the stanzas were supposed to include a reference to a specific season depending upon their place in the renga. These rules also said that the hokku (the opening stanza of the renga) must include a reference to the season in which the renga was being written. A lighter form of renga called haikai no renga ("playful" linked verse) was introduced near the end of the 15th century; thus haikai was the linked verse practice followed and elevated by Matsuo Bashō and others until the Meiji Era (1867-1912). Near the end of the 19th century, the hokku, the opening verse, was completely separated from the context of haikai no renga by Masaoka Shiki and revised and written as an entirely independent verse form, though retaining the kigo. In the Taishō Era (1912-1925) a movement began to drop the kigo entirely. Today, however, most Japanese haiku still contain a kigo, although some may omit it. Many haiku written in languages other than Japanese may omit kigo. Following scholarly precision, the term haikai is used here for the pre-Shiki form and haiku for the post-Shiki form, though popular usage often anachronistically applies haiku to both pre- and post-Shiki verse. Much of what is said here of kigo use in haiku applied to haikai (and the hokku of renga) as well. 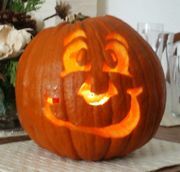 A Jack-o'-lantern lit by a candle inside. 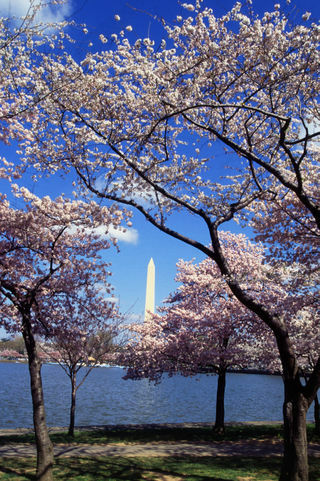 Cherry blossoms ( sakura), often simply called blossoms (hana) are a common spring kigo. Spring (haru) - the name of season is a kigo or season word. Other combinations are Spring begins (Haru tatsu), Signs of Spring (haru meku), Sea in the spring (haru no umi), Spring being gone (Iku haru). Higan of Spring (春彼岸, haru higan, literary beyond the border of this world), one week around Spring Equinox (shunbun) has a significant period for Buddhists to soothe their ancestors' souls and grave-visiting as well as Higan of Autumn. February (kisaragi or nigatsu), March (yayoi or sangatsu) and April (uzuki or shigatsu). The third month (sangatsu) in the Japanese calendar is equivalent roughly to April in the Gregorian calendar, therefore End of March (sangatsujin) is equal to End of Spring (haru no hate). Spring mist or Spring haze (kasumi) - all spring - the daytime haze of spring. 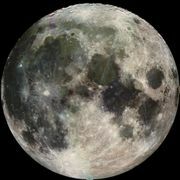 The night-time haze during spring that can obscure the moon is called oboro. Haruichiban, the first strong southerly wind of spring is used as kigo in the modern haiku. cherry blossoms ( sakura) and cherry blossom-viewing ( hanami) - late spring (April) - for the Japanese, cherry blossoms are such a common topic that in just mentioning blossoms (hana) in haiku it is assumed they are cherry blossoms. 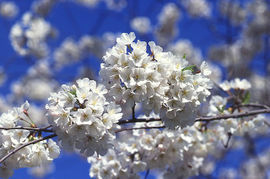 Blossom-viewing is an occasion for partying with friends or coworkers. Hanamatsuri (Blossom Festival), Buddhist festival celebrating the birth of Buddha, on 8 April. Hinamatsuri (Girl's Day) Doll Festival and Hina (doll) - a traditional Japanese festival for girls on 3 March. Rainy season (tsuyu) - the Japanese rainy season, usually starting in mid June. 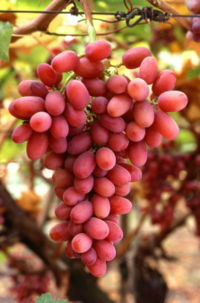 Grapes (budō) are a fruit typically harvested in Autumn. Milky Way (amanogawa, lit. "river of heaven"), because in the autumn it is most visible in Japan. It is associated with Tanabata. 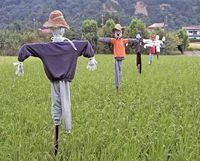 scarecrow in early autumn paddy field. Nashi pear (梨 nashi), Chaenomeles (boke no mi), peach (momo), persimmon (kaki), apples (ringo) and grapes (budō) are examples of fruit that are used as autumn kigo. colored leaves (momiji) - late autumn (October) - a very common topic for haiku along with related topics such as first colored leaves (hatsu momiji) mid-autumn, shining leaves (zōki momiji) late autumn, leaves turning colour (usumomiji) mid-autumn, leaves start to fall (momoko katsu chiru) late autumn, etc. Leaf-viewing is a common group activity. 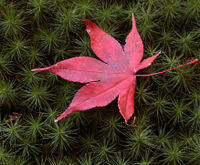 Autumn Festival (akimatsuri) - Autumn festival is mainly in the purpose of the thanksgiving for harvest. Other feasts in the Autumn, including Tanabata (the festival of the weaver maiden and the herdsman in the Heavenly Court), Grave-Visiting (haka mairi), and Bon Festival (Festival of the Hungry Ghosts) - all early autumn (August) - are kigo as well as associated ornaments and activities like small bonfires called mukae-bi with (welcome-fire) and folk dancing (odori) to Bon festival. fugu soup (fugujiru), Anglerfish or sea-devil stew (ankō nabe), oyster (kaki) - seasonal dishes. Christmas - this is a modern kigo. It was not used in the Edo period, when Christianity was forbidden. New Year's Eve ( ōmisoka or toshi no yo, literally "The end of year"), and the New Year's Eve party (toshiwasure). Kan (kan), days form 5 or 6 January till 4 or 5 February (literary Coldness) - derived originally from the Chinese 24 seasonal periods. Also Daikan (Great Coldness) on 5 or 6 January, or its other name Beginning of Kan season (kan no iri). Japanese New Year (正月 shōgatsu) * As in many other cultures, the Japanese New Year is an important time of year for celebrations and there are many activities associated with it that may be mentioned in haiku, including some "firsts": first sun (hatsuhi), first laughter (waraizome), and first calligraphy (kakizome). There is also New Year's Day (ganjitsu). 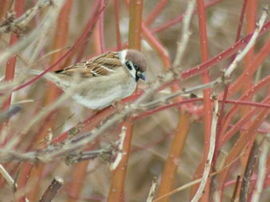 first sparrow (hatsu-suzume) * - the first sparrow helps welcome the New Year. New Year's Day customs: kadomatsu * (a traditional decoration usually made of pine and bamboo that is place on the gate or outer doorway), otoshidama (the custom of giving pocket money to children), toso (a ritual mulled saké only drunk on New Year's Day). osechi (traditional Japanese New Year's Day food): zōni * (a traditional vegetable broth with mochi—sticky rice cakes. The ingredients for zōni vary greatly between regions in Japan. ), seven herbs (nanakusa) and rice porridge with seven herbs (nanakusa gayu), eaten in the evening of 7 January. Switching from the old Japanese Calendar to the Gregorian Calendar brought about numerous changes in life in Japan. Even traditional events have been affected by this change. 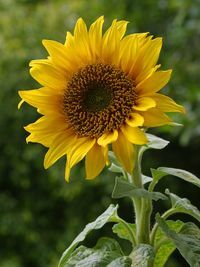 Since kigo is affiliated with the seasonal events, several modern haiku poets have had to reconsider the construction of kigo and its attribution to season. One of biggest changes was the creation of a "New Year" part as a seasonal sectioning of kigo. One typical example is the case of Tanabata. Traditionally the date of Tanabata is 7th day of the 7th month of the Japanese calendar, therefore in August of the Gregorian one. 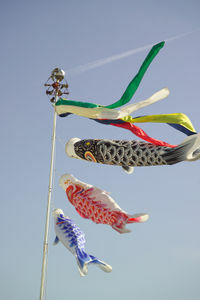 Today in many places it is celebrated on 7 July, hence there is a dispute as to whether Tanabata should be treated as a summer kigo. Although haiku started as a Japanese poetry form, it is now written around the world in many different languages. William J. Higginson's "Haiku World" (1996), which is the first international saijiki, has more than 1,000 poems, with over 600 poets from 50 countries writing in 25 different languages. The writing of haiku around the world has only increased with the advent of the internet, where one can even find examples of haiku written in Latin, Esperanto, and Klingon, as well as numerous examples in more common languages. These international haiku poets have had to adapt the idea of kigo to their local conditions and culture. Many phenomena that might be used as kigo are similar around the world, such as the blooming of flowers and trees in the spring, and the migration of birds in the spring and autumn. Even if the trees and birds are not the same as in Japan, the concepts are still the same. There are many local cultures around the world, but you can still find both similarities and differences. One similarity is that many areas have harvest festivals with bonfires. 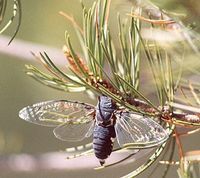 One difference between locations is that for a bird that migrates, some places will view that bird as a winter resident, or as a spring and summer breeder, or as an autumn and spring migrant. 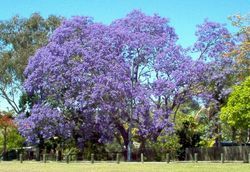 a large Jacaranda tree in full bloom. 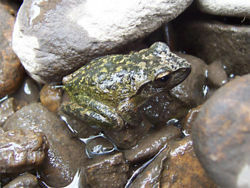 In the famous hokku by Matsuo Bashō below, "frog" is an all spring kigo. Hokku have been traditionally written about the singing of mating frogs, but Bashō chose to focus on a very different sound. For classic pre- Meiji era haiku (before 1868), almost all haiku had a kigo. For example, Japanese experts have classified only about 10 of Matsuo Bashō's ( 1644- 1694) hokku in the miscellaneous (zō) category (out of about one thousand hokku). As with most of the pre-Meiji poets, Bashō was primarily a haikai no renga poet (that is, he composed linked verse with other poets), so he also wrote plenty of miscellaneous and love stanzas for the interior lines of a renga. Usually about half the stanzas in a renga do not reference a season. Bashō also thought that if a hokku contains an utamakura, then the kigo should be omitted (an utamakura is a place name with poetic connotations and is used as a keyword—utamakura are usually used in waka and not in haiku). A little later Kobayashi Issa ( 1763- 1828) (who wrote mostly hokku and not renga) wrote 109 hokku without season words (out of a total of roughly 20,000 haiku). The Meiji era poet Masaoka Shiki ( 1867- 1902), who recommended several major reforms to the writing of hokku and tanka including an expansion in subject matter and vocabulary, still included kigo in his revision of hokku, which he renamed haiku. Experts have classified a few hundred of Shiki's haiku in the miscellaneous category (out of the few thousand that he wrote). His follower Takahama Kyoshi, who was the most influential haiku poet in the next generation after Shiki, also emphasized kigo. 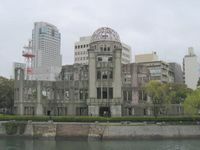 However, in the early part of the 20th century, there were a number of Japanese poets, such as Kawahigashi Hekigoto, Ogiwara Seisensui, Noguchi Yonejiro, Taneda Santōka, Ozaki Hōsai, Nakatsuka Ippekirō, and Natsuishi Ban'ya who were less concerned about the traditions of haiku such as the inclusion of kigo. Some, like Hekigoto and Seisensui, actively opposed the insistence on kigo, but even these iconoclasts often included kigo in their haiku. There are, however, some reformers who have made suggestions such as using the idea of keywords (which would include kigo as a subset). 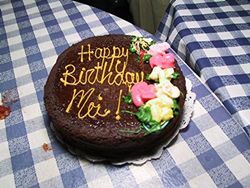 Keywords are words, such as dawn, birthday cake, ocean wave, beggar or dog, that have strong associations with them, but are not usually associated with a particular season. Birds that do not migrate, such as Pigeons or Sparrows, are additional examples of keywords (or could be considered nonseasonal topics).